Born in Kashmir Valley and familiar with an urge called, “The call of the Mountains’, this desire of visiting the mountains used to often result immediately in preparing my backpack and ready to start climbing. Post 1990 in exile, the call of the mountains resulted more in nostalgia and inaction, I have to admit that I was a bit of a snob when it came to the mountains. After having lived in Kashmir for 20 years and trekked in most beautiful parts of the Valley and beyond, when I was first introduced to the terrain of the neighbouring states, to be honest I wasn’t too impressed. But as years passed by, I learnt to appreciate the diverse beauty and its beautiful people. I was also older now and was able to let go of my resistance of constant comparisons to Kashmir which only made me unhappy. I slowly began to appreciate nature beyond Kashmir and started to admire beauty all around without being selective or limited to my first 20 years of my life. 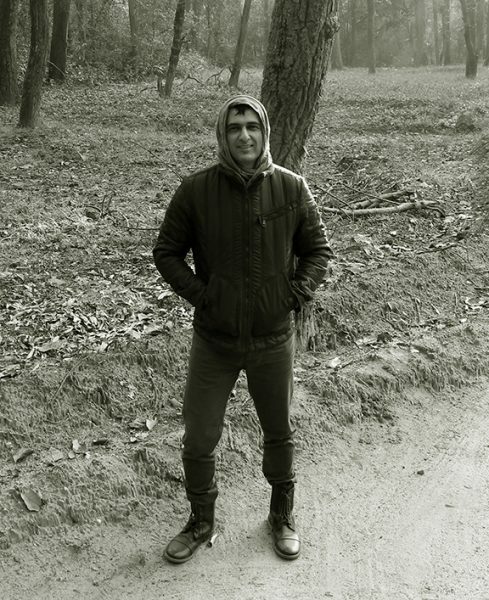 My parents introduced me early to wild life sanctuaries and the most convenient and obvious choice for someone living in Srinagar was the very own “Dachigam National Park”. The park is located in the Zabarwan Range of the western Himalayas and was just 22-23 kms away from home in Srinagar. Frequent picnics after obtaining the necessary permits to access the National park was the mother of all picnics for us, as we as children got to see the Hangul, or the Kashmir stag in this beautiful coniferous forest with meadows and waterfalls. Although I never got lucky spotting the Himalayan black or brown bear but the stories that they would often visit the buffer zone in search of corn was exciting enough for me as a child. “Bhaallu” was to us what “Tiger” was to others. Like any child or infact even adults would ask the local forest guards and caretakers, ‘what will happen if we encounter a Bhaallu’ ? ‘Would he kill us or slap us ‘ ? The forest guards would tell us, “You have to act dead and not move as then they do not feel threatened and they would go away”. But one of the guards had another story to tell, “They often put their finger in your ears to check if you are dead or not”. That was enough for us 8 to 10 years olds to feel scared and yet remain excited about “The Bhaallu”. Later as a young adult I had the opportunity to visit few more National Parks like the Jim Corbett National Park in 1991, a Project Tiger Reserve that lies in the Nainital district of Uttarakhand. 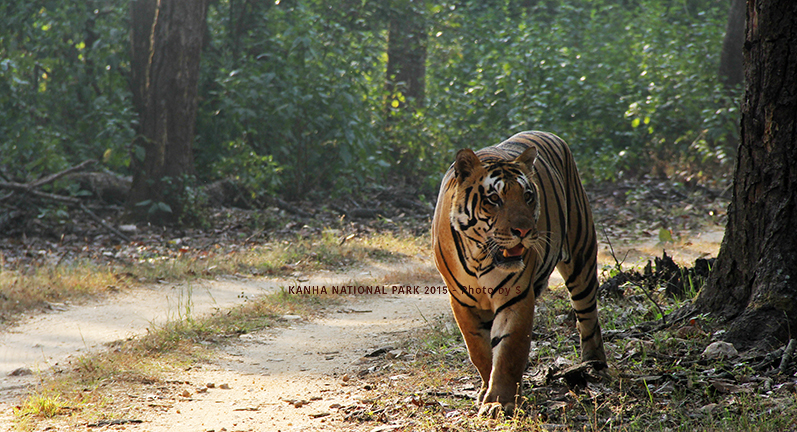 I was fortunate to have stayed at the Dhikala Zone which is about 40 kms into the dense reserve. Kaziranga National Park in the Golaghat and Nagaon districts of the state of Assam, also is a World Heritage Site, the Bandipur National Park, where we were once stopped due to the news of a bandit hiding in the jungles where a massive manhunt was launched. The Mudumalai National Park and Wildlife Sanctuary, which was later, declared a tiger reserve in Tamil Nadu. After having visited few of the National Parks earlier, I recently visited another one after a very long gap. 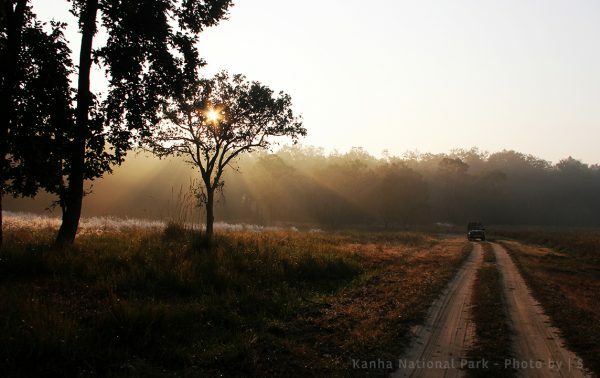 It was none other than the amazing and beautiful Kanha National Park in Madhya Pradesh, which has left me stunned, as never before have I felt withdrawal symptoms for the wild or may I call it, ‘The Civilized world’ . 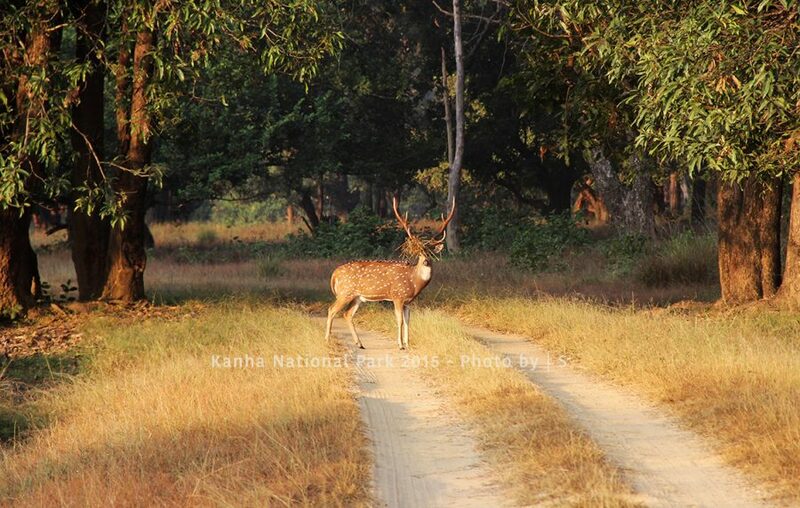 Scenic lush Sal and bamboo forests, grassy meadows and ravines of Kanha are breathtaking. My flight to Jabalpur was just over an hour from Mumbai. Jabalpur airport, which is maintained by the Air force, has a few flights from Mumbai and the flight time suited me as it would get me to my destination Kanha in time which is about a 4 hour drive from Jabalpur. Soon after landing in Jabalpur the excitement started to build up as spotting Wild Boars around the airport itself was a common site. Sometimes they even come on the runway causing a bit of stress to the pilots and authorities. My eyes started to adjust very easily to the lush green environment around especially after landing from a big Metropolis like Mumbai. 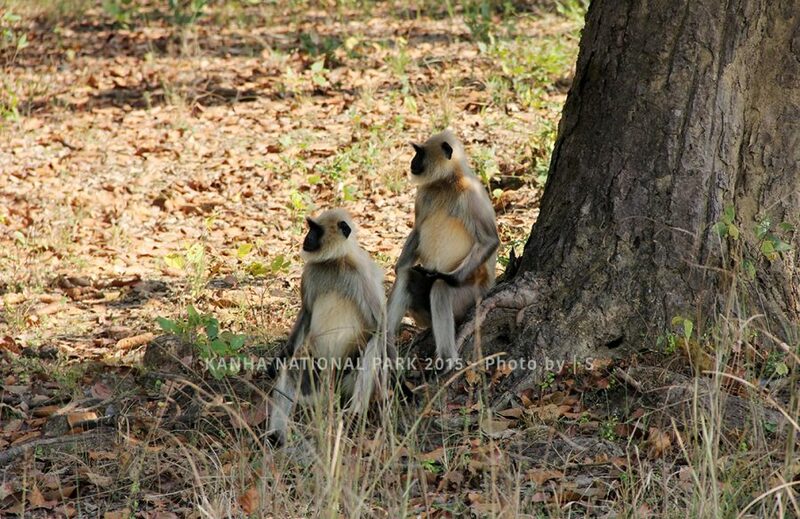 I started my road journey to Kanha which took about 4.5 hours through vast expanse of land with lush Sal trees around and the very cute langurs as passerby’s. The sunset with its magnificent colours devoid of pollution was a sign of nearing the land of the wild where the rules are laid by nature for nature and only managed by humans for humans. I knew I was approaching, “The Wild”. The stay was organized just outside the buffer zone in a beautiful Lodge called, ‘The Kanha Jungle Lodge’. Welcomed with tremendous warmth by the caretakers, we were offered warm wet face towels to clean our hands followed by refreshing lemon grass beverage which was just the perfect way to refresh ourselves from the journey. The excitement of being at the periphery of the National Park and going into the jungle early morning at 5am was enough to lose your sleep in excitement. All were warned to be on time as no one wanted to miss a possible citing because of delays as the park gates would open at sharp 6am. Ready at 4.30am blending with nature in Indiana Jones inspired clothes with a Camera in my hand, I felt ready to witness the royalty if I got lucky. Somewhere at the back of my mind I was not too sure if I would get lucky or not because during my last visits to many National Parks, I’d had no success of seeing the Big Cat. The clothes had to be warm in the morning as the dense jungle is much cooler and being in open jeeps would add to the chill factor. 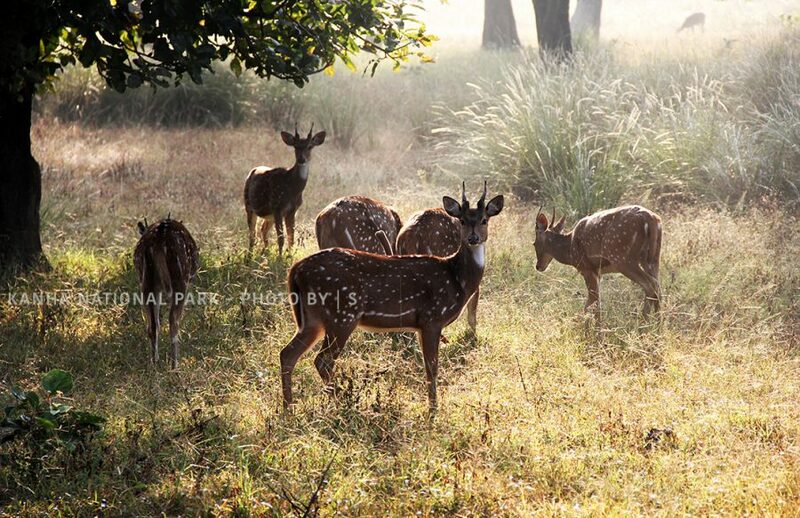 Hoping for the best and prepared to see miracles of nature with the beautiful Swamp Deer (Barasingha) found only in Kanha, the sloth bear, Sambhars and Gaurs , the Indian wild dog, more Langurs, birds and the wild boars if not the Royalty. About 20 mins into the sanctuary we heard the first ‘Call’, which was exciting enough to raise hopes of a citing. Halting our jeeps and listening to the ‘calls of the jungle’ that the big cat could just be around was an experience that cannot be articulated as its needs to be personally experienced and felt. The atmospheric excitement gives you an adrenaline rush which is nothing less than being addictive. 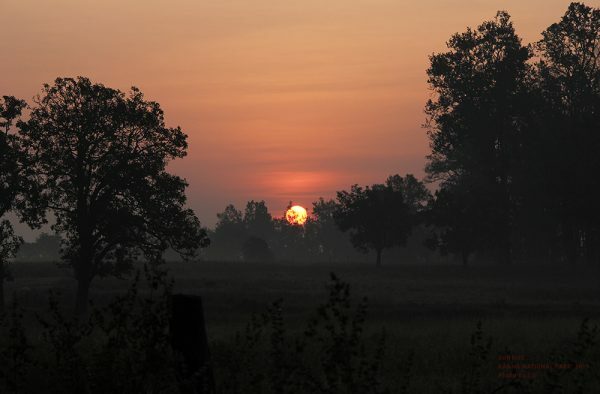 After a few calls and witnessing the stunning sunrise through the grasslands was a picture perfect image that is enough to soothe your senses far and away from the noise and pollution of the so called civilized world. 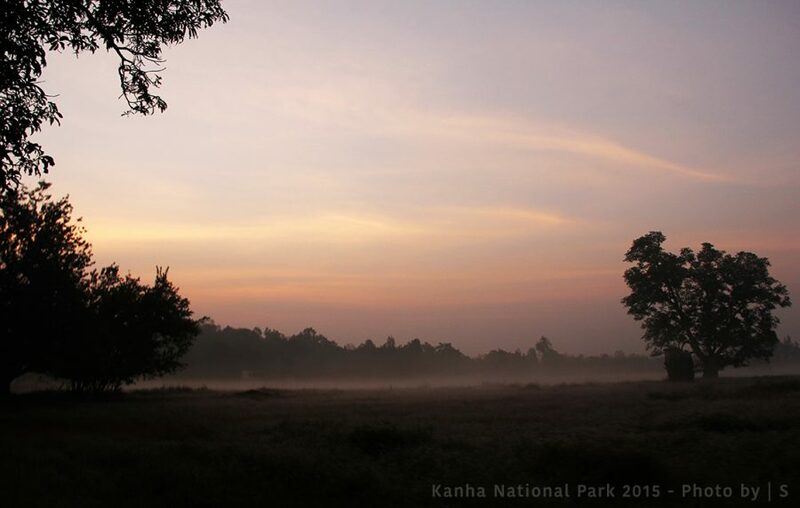 It was like my lungs thanked me for letting in some fresh Kanha air and eyes witnessing the fauna and flora of the reserve. After driving, stopping and then driving again in search of a tiger, we stopped for breakfast at about 8.30am at one of the spots in the jungle where all the tourist jeeps come and halt. Stepping down from your jeeps is not allowed anywhere in the jungle except in these cordoned off areas which is a very sensible rule. The breakfast halt is the place to stretch, visit the washroom and eat your breakfast and of course, a place where all the guides and tourists discuss their morning experiences of listening to the call or if anyone spotted the Tiger. Each jeep carries neatly packed food and the guides efficiently repack everything they had brought without littering the environment. I was truly very impressed with this wonderful system and just wish if we in the cities could follow such a discipline and be more sensitized towards our environment. This was day one and it was a little beyond 9 am, after a healthy breakfast in the jungle we once again started our jeep safari. We drove towards an area where there had been some calls about an hour ago but the tiger may have moved in just about any direction. Driving around for a few more minutes in the reserve hoping to see the tiger, we were suddenly surprised to see the Royalty sitting comfortably on the jeeps path in front of our eyes just a few yards ahead. Oh…My God! I couldn’t believe my eyes; it was like he was there to make things easy for us and that was the Royalty sitting just a few meters away in front of us. We all stopped and all started to speak in whispers, all cameras in position, anticipating his next move was a thrill as if it was like the best thriller experience listening to our own heartbeat grow faster. 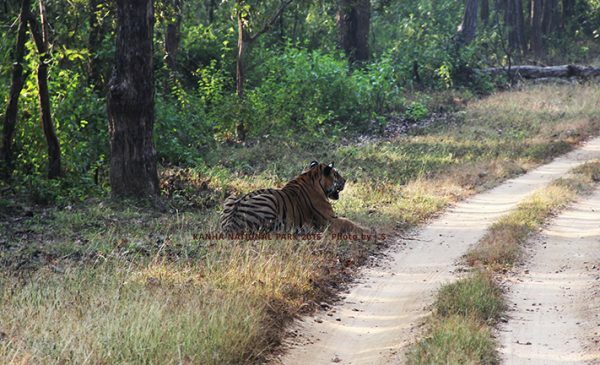 The Tiger suddenly stood up and turned towards us. That look in the eye can be so magnetic and I think it would be appropriate to say, “Dear Tiger, you had me at Hello !” Slowly he started to move towards us with no threat in his movement and body language and our forest guide respectfully started to swiftly reverse the jeep . “We must respect his space and let him go where he wants to. We definitely do not want to disturb and irritate the tiger,” said the guard and we couldn’t agree more. He walked towards the jeep and we kept reversing upto a point where other jeeps had also arrived behind us and we could reverse no further. That! was a tense moment. We were a few feet away from him now and any tentative movement could change the mood of the situation. But thankfully , the tiger wasn’t interested in us and he casually decided to turn direction and move another way. One leap from a few meters away is nothing for a tiger and we could be his meal but the idea is to maintain a distance and not to come in the way. Soon the tiger went off into the dense jungle. A moment when u wanted to tell him, “Palat , Palat , Palat”. Happy and excited but not content for sure , so our guide who knew of the tigers trail said that we shall catch his next glimpse from a vantage point . About 6-7 jeeps stood like the paparazzi at a point where the Royalty was expected to walk out from the dense forest. 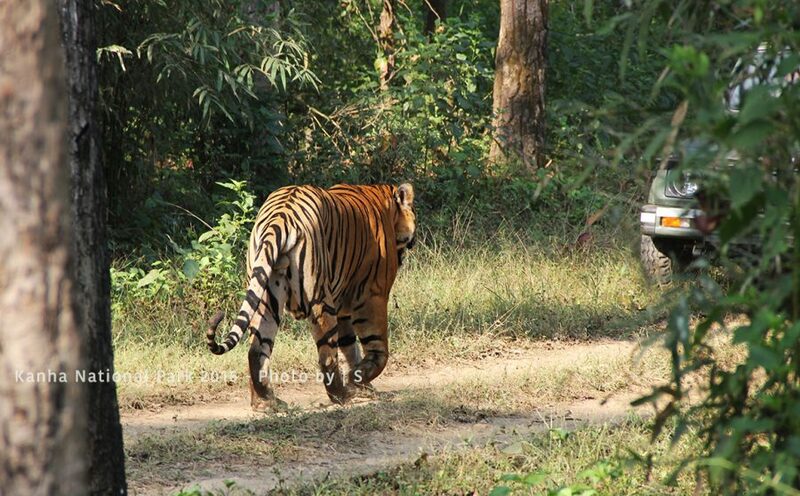 Unlike many celebrities , the tiger did not make us wait and in about 5 minutes he walked out of the thickness of the jungle facing our jeeps , everyone excited and quite, cameras clicking , almost like a Red Carpet situation. We all got our shots and realised that greed in such moments is not a good idea and we should start backing up so that he can have his peace. All the jeeps backed up and bid adieu to the Royalty. Satisfied but somewhere wanting some more was the common feeling amongst us all. Next 2 days I went into the reserve with no luck of citing the tiger. It was as if the first day one saw the trailer and the film together. Next two days were spent learning and appreciating the birds, other diversity in the jungle and a wonderful walk in the buffer zone of the forest. 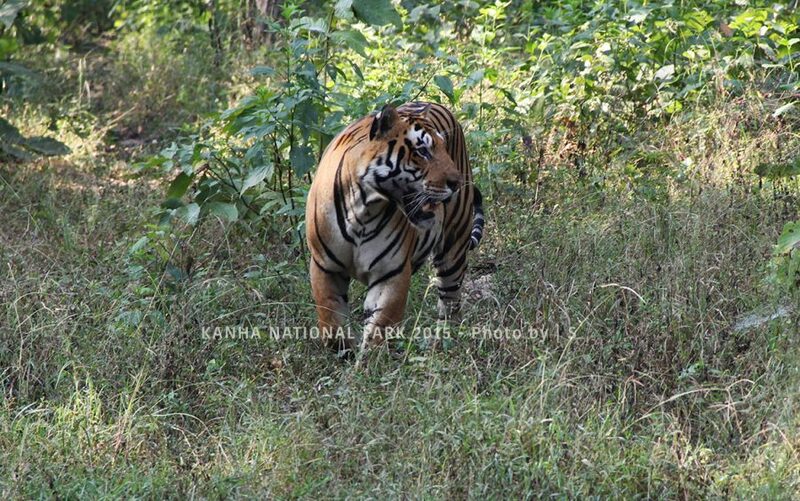 An experience I cannot forget and I promised to be back for more at Kanha National Park which I would recommend to one and all. I know I will do so when I get that call and have to do some more Incredible India travelling. A vivid account of your experience of wild life,very well written ,I must say .